Mountain gorilla trekking safaris in Rwanda is done in the most famous Volcanoes national park which is home to over 400 mountain gorilla species .different habituated gorilla groups have been habituated and opened for tourism activities and hence tourists can choose to spend time with Susa gorilla group. A group of eight tourists are allowed to trek and spend one magical hour with this famous group of gorillas. Rwanda gorilla safaris destination of Volcanoes offers tourists with an opportunity to encounter prominent Susa gorilla group which is composed of 41 individual gorilla members; Susa is the only group with highest number of gorillas in Volcanoes Park and therefore trekking this specific gorilla family enables the visitor to enjoy the sights of the gorillas without disturbance. It mainly consists of 3 silver-backs as well as several females and young sters and several juvinile gorillas. The Susa group is the most popular group because of the 5 year old exciting twins identified as Byishimo and Impano .These twins are very stunning and playful and hence make this group a dream for each and every tourist on his gorilla safaris in Rwanda’s Volcanoes Park. This particular family roams on the slopes of Karisimbi Volcano (4507M) which is the highest volcano among the eight volcanoes of the Virunga Mountains. Trekking this group makes tourists to have full hiking experience when searching for the mountain gorillas. The Susa Gorilla Family is partitioned into two i.e. 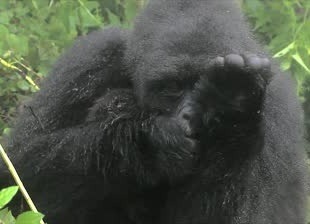 Susa –A which is commonly found on the lower side of the forest while Susa – B also called the Karisimbi gorilla family which is situated on the upper part of the forest. This particular gorilla group sometimes moves to places of higher altitude and this makes tracking even more difficult but more rewarding. However, trekking this group enables travelers on their Rwanda safaris to enjoy one magical hour with this gorilla group because chances are 100% for one to encounter this group face to face. This is the hardest gorilla group to trek but the most rewarding gorilla group to spend time with, so visitors must be physically fit and well prepared with enough water, food as well as good garden gloves plus even strong shoes. From the Volcanoes Park main building, the starting point to trek this group is located at an estimated distance of one hour’s drive. To enjoy the experience of hiking when searching for this gorilla family one needs to pay for the helper to lift or carry the trekkers stuff because the hike will lead you up to 3400m high in the hills before one meets this group of the gorillas.